A paper published today in Global and Planetary Change reconstructs sea levels in SE Vietnam over the past 8,000 years and finds sea levels rose 37 mm/yr from 8,100 to 6,400 years ago to ~1.5 meters [5 feet] higher than the present, but dropped from 6,000 years ago to the end of the reconstruction 630 years ago. Natural sea level rise was much greater than the present during the last interglacial, and during the current interglacial, without man-made CO2. Horizontal axis is thousands of years before the present. "msl" at 0 on vertical axis is modern day Mean Sea Level.Fig. 4. Holocene sea-level curve constructed from sea-level index points in Table 1. msl = mean sea-level, mssl = maximum springtide sea-level. Mekong vertical error-range (tidal range) is 2.8 m; SE Vietnam vertical error range (tidal range) is 2.3 m corresponding to the actual tidal range at Mui Dinh tide gauge station. Symbol widths match calibrated ages ± 2 σ. Slight sea-level drop at an average rate of 0.25 mm/yr after 5000 yr BP. Beachrocks, beach ridge, washover and backshore deposits along the tectonically stable south-eastern Vietnamese coast document Holocene sea level changes. In combination with data from the final marine flooding phase of the incised Mekong River valley, the sea-level history of South Vietnam could be reconstructed for the last 8000 years. 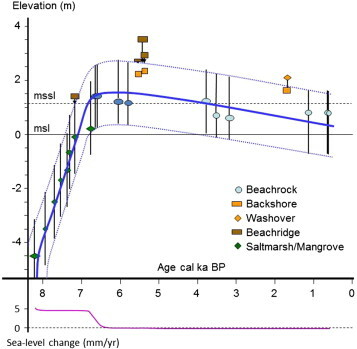 Connecting saltmarsh, mangrove and beachrock deposits the record covers the last phase of deglacial sea-level rise from -5 to + 1.4 metres between 8.1 to 6.4 ka. The rates of sea-level rise decreased sharply after the rapid early Holocene rise and stabilized at a rate of 4.5 mm/yr between 8.0 and 6.9 ka. Southeast Vietnam beachrocks reveal that the Mid-Holocene sea-level highstand slightly above + 1.4 m was reached between 6.7 and 5.0 ka, with a peak value close to + 1.5 m around 6.0 ka. This highstand is further limited by a backshore and beachridge deposit that marks the maximum springtide sea-level just below the base of the overlying beach ridge. After 5.0 ka sea level dropped below + 1.4 m and fell almost linearly at a rate of 0.24 mm/yr until 0.63 ka and + 0.2 m as evidenced by the youngest beachrocks. The Holocene sea-level fluctuations observed in Southeast Vietnam resulted from eustatic and isostatic processes. The sea-level rise up to the mid-Holocene highstand was provoked by the last melting phase of glacial polar ice-sheets. The sea-level drop after the mid-Holocene highstand was induced by the isostatic processes of Continental Levering with an uplift of continents in low latitudes and depression of adjacent flooded continental shelf areas and Equatorial Ocean Siphoning transferring oceanic waters from low latitudes to the increasing volume of oceanic basins in higher latitudes. The regional expression in terms of magnitude and timing of relative sea-level change might contribute to validation of geophysical model simulations.